An airside crash at London's Heathrow Airport between two vehicles has caused the death of a British Airways engineer, its been confirmed this afternoon. The British Airways employee died after the two vehicles collided on a taxiway at the airport at around 6am this morning. The man, in his 40s, suffered a cardiac arrest at the scene and died, despite attempts to save him, both at the airport and on the way to a local hospital. A second man involved in the crash has also been taken to hospital with a suspected broken shoulder. 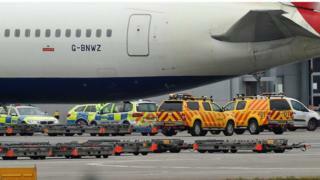 A number of British Airways flights were delayed by the crash yet terminal five and the airport remained open during the incident. Passengers on one plane were forced to disembark after the accident happened according to a Heathrow Airport spokesperson. "Our deepest condolences go to the family and friends affected by this accident. We will be fully cooperating with the police in the investigation which will follow." A spokesperson for British Airways commented, "We are deeply saddened by this tragic incident and are offering our full care and support to his family and colleagues." The Health and Safety Executive has been informed and as yet there have been no arrests according to the Metropolitan Police. ❗This article was written for this site by a member of our team 🙋, please do share it with your friends via social media. You are also welcome to post it or republish elsewhere on the 🌎web on the condition that you credit the author and link back to our site. Thank you. Chief Aviation Correspondent. Jason has many years experience of the aviation and media industries. He has written numerous articles, reports and features for various publications and is the author of a number of both nonfiction and fiction books. The airline, airport and aviation blog and news source. Here you'll find the latest news from the industry as well as comments, reviews and insight. Norwegian and Airbus agree on postponement of new aircraft delivery. Jason Shaw's love of the aviation industry started at a young age when he used to watch the whirlybirds of Bristow Helicopters coming and going from the garden of his Surrey childhood home. Since those days he's worked in a number of key areas within the aviation industry from airlines, travel agents, holiday companies and product selection to reporting on it for local radio and making video travel brochures. Jason is also an experienced broadcaster, having presented on radio, television, corporate videos and video travel brochures. He's an avid writer and written a number of books, articles, features and reports. He also loves to travel and his favourite destinations include Port Douglas, Singapore and Copenhagen. Josh loves to travel and has a passionate interest in the airline industry. He's worked in both travel and the media for a number of years. His voice can often be heard on Internet-based radio stations as well and the odd commercial! The destination he calls his favourite is - New York. Adam is the youngest member of the team, no relation to Jason and like the rest of the team, he has a keen interest in airlines, aircraft and aviation. His favourite destination is Prague and has just started taking flying lessons. © Seafront Media 2019. Simple theme. Powered by Blogger.